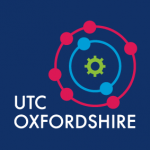 A group of UTC Oxfordshire girls were recently given a full behind-the-scenes tour of a Formula One factory as they visited Williams Advanced Engineering. 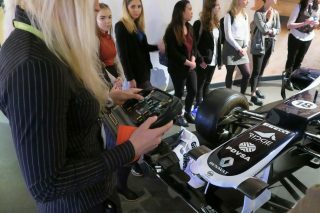 The students learned how a Formula One car is built and put together on-site, from the company’s composites department all the way to the race bay where this year’s car is stored between races. 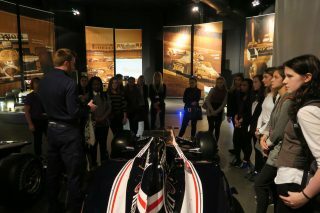 The girls were then taken to Williams’ Museum, which contains a selection of the most iconic cars from the firm’s 40-year history, including some of their championship winning cars. Students were given the opportunity to meet some engineers and apprentices, as well as Head of HR, Nicola Salter, who was on hand to answer questions about university choices, paths into engineering and application processes. 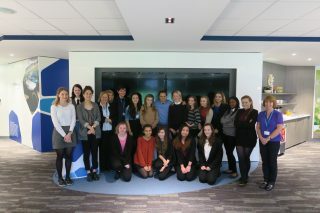 One of Williams’ current Formula One drivers, Felipe Massa, also came to speak to the girls about being a racing driver and they were given the opportunity to ask him about his role. Felipe’s Race Engineer, Dave Robson, was on hand to talk about the importance of his relationship with a driver in the competitive world of Formula One. It was a fantastic day and opened our students’ eyes to some of the potential engineering careers that may be available to them in future.